These X-Static silver protection socks are suitable for all year round comfort wear as well as being the perfect accompaniment for any trouser. Silver ions built into the sock weave keeps feet warm in the winter, cool in the summer whilst silvers anti-bacterial and anti-odour properties keeps the socks fresh. A three pair pack of our hardest wearing work socks. 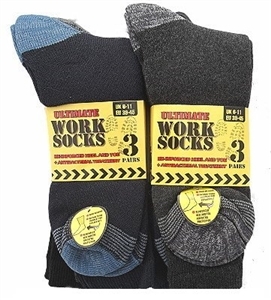 With a reinforced toe and heel, these socks make for perfect wear in boots for work, or even for trekking and walking! These socks give you anti-microbial protection, to keep your feet feeling fresh and clean. They also feature a fully cushioned foot, to ensure that your feet are kept comfortable and blister-free throughout the day. Made From: 55% Cotton, 32% Polyester, 10% Nylon and 3% Elastane. *Please note, packaging may vary from the original picture* These high quality cotton-rich socks have a loose top, and so are less restrictive. This provides extra freshness and comfort. The sock is designed with three unique relaxation panels, which contract vertically so the socks stay up in comfort all day long without leaving marks on the legs or restricting circulation. Proven comfort, and highly recommended for those with circulatory problems. These wool-rich socks will ensure your feet are warm and comfortable all day long. Like our cotton socks, they have a loose top, and so are less restrictive. This provides extra freshness and comfort, and ensures that the socks stay up in comfort all day long without leaving marks on the legs or restricting circulation. Proven comfort, and highly recommended for those with circulatory problems.